this forum always provides me with valuable info, especially in areas I have never considered. Propane tanks - I don't have one and could not imagine needing one on my little vessel. But, I do have a couple 1 lb. bottles of "Coleman propane fuel" for my Magma grill. My boat actually came with 2 grills and 2 bottles. I disposed of the 2 bottles that came with the boat since I could not verify their integrity. Bought 2 new bottles last year, but have yet to use them. The grill mounts on the stern rail, so cooking from the cockpit puts one in close proximity to the bottle / grill if ever there was a problem. 1. Does anyone have any experience to share using these propane bottles aboard? 2. What are safety precautions to take prior to use? Can they be tested safely? 3. Proper storage aboard the boat? I think a boat WITHOUT one of these grills would be an oddity. They need to be stored outside someplace so they won't leak into the inside of the boat. Some people make holders out of PVC pipe. There is no way to test these I know of, I throw them away if they manage to get too rusty before they run out of gas. Can't take credit for anything other than Google chops... Std 4" PVC waste pipe and fittings. Great idea for storage and transport of gas cylinders on a boat. IMO the gas in the cylinders should be odorized. R\E the "over the side" grills: If you do literally use it over the side of the boat dinner has a nasty habit of falling in the water. Over the boat is much better. floating loose in a locker somewhere, which is how the PO had them. Just want to be clear, it's just something I've read about in other places. Don't have one on my boat, that's not my picture. I've heard that they hold a standard Chardonnay bottle as well, but again, hearsay. Here's where I saw it the first time - and the writer mentions he heard it somewhere else - the idea has been around. He mentions the crux of the matter - tie a string around the neck of the bottles so you can fish them out if they're more than one deep. Good idea. This guy used to do boat restoration, IDK if he's still in business, but his work and attention to detail is completely over the top. It's worth poking around on the website to get ideas and inspiration. Last edited by BunnyPlanet169; 03-29-2017 at 09:19 PM. I am using a tupperware type container with flip over handles. it is probably not air tight, but I figure it is better than nothing. I also store my green 1lb. 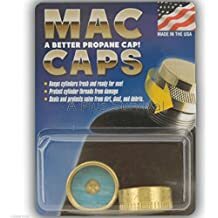 cans with Mac Caps. Now when I disconnect them I always hold the bottle up to my ear to see if I can hear any gas escaping. It may have been the case that this was a pretty old cylinder - we bought a bunch on sale and they lasted us quite a few years - but maybe the sealing mechanism does not last that long? I think it is made of rubber. Based on my experience camping, proper storage on a boat very important for these small bottles. And I no longer buy them in bulk. I propose storage of the small one pounders is equally important as the larger tanks. Propane is propane regardless of the container. 10-4 on that. Please remember my suggestion of the foredeck anchor well for those who are so equipped for the small point of use tank storage. It's sealed from the interior of the boat, open to the deck and has an overboard drain thereby meeting most of the requirements. I just thought of this. I went sailing with a guy from my dock. It was a 35 foot center cockpit sloop. Thanks to all for the insights here. A wealth of informaiton as always. And thanks for the pointer here. Just ordered myself a pair of these caps. I like the idea of the caps providing some redundacy to achieve a tight seal, for storage anyway. And I will be sure to check for leaks following each usage. the guy you refer to in post 32 is Tim Lackey, quite a craftsman. he works in Maine, search Lackey Sailing to see what he is working on. I also keep reminding myself that Deepwater Horizon was done in by CNG, so it is no excuse to let your guard down. I've had exactly the same thing happen with a stovetop coffee pot boiling over. 1. lockers shall only open from the top ... so one that you have to lie down sideways to remove the tank I would say would be a no-no. 2. you can't store anything else in the same locker, so using the anchor locker is a no-no ... and I'd say even if you relocate the anchor, chain and rode elsewhere it still wouldn't meet the requirements, unless modified, because it's of a design the just begs you to also use it for storage (like for that anchor, chain and rode that is now in the way on the deck!). 3. Hanging the propane tank, regulator, etc. off the stern rail ... it needs to be protected from the weather and against mechanical damage. So ... does that mean you still need a locker? Probably. 4. Your regulator relief valve outlet has to be at least 20-inches from any opening to the boat's interior. What's usually on the stern of a sailboat and in many cases about 20-inches from where a rail-mount tank and regulator is located? Blower intake and/or exhaust. Oops! 5. How about the overboard vent from a propane locker ... it too has to be at least 20-inches away from any opening. Exhaust and bilge pump outlets? I guess they would qualify (to the letter of the reg, but since they (should) have vertical loops, I highly doubt propane vapours would be an issue). 6. The regulation does allow you to have a propane locker inside the boat as long as it's in a boat locker that opens to the outside and the propane locker is located as high and close as possible to the locker's opening. So .... as far as I can tell ... it ain't an easy proposition. By the way ... anyone with a current (2013 ... not 2000) version of the regulation able to comment on any specific changes? I'm interested in keeping this discussion going .... updated regulation?? Anyone had any further brilliant ideas on a propane locker layout? My C&C 27 doesn't really have many options. Given that I have a propane stove, cabin heater and BBQ and my current regulator, valves, solenoid are in dire need of replacement ... I'd be interested in any suggestions on getting that tank off the stern rail. I'm thinking might be easier to locate a box with a couple 10-pound tanks.